That is from one of my favorite Ren & Stimpy episodes, also the one that introduced me to the series. Yes it's one of my favorites too. Thanks Pouch Junior! Hey I checked your blog. Funny designs! Thanx you so much! Hope I could be a cartoonist one day. Looks like Klasky-Csupo to me. That's fantastic, and hi-res too! A treat for us old R&S fans. Seasons 3 and 4 had some really decent stuff going on, they don't get as much acknowledgement as they should. Very cool that you have a blog! Will definitely keep checking in. 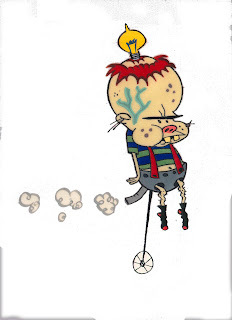 I love this guys..it reminds me how much Ren and Stimpy influenced me as a small child. I attribute much of my insanity to that show and the detailed and creative artwork. Thanks it's nice to hear that sombody like seasons 3 and four. We had to produce many more cartoons more quickly (on time and on budget) so it was a struggle. Fortunately most of the original crew was there to get the job done. Many great directors and top industry artists came form those cartoons. Thanks Terry. Small child? Yikes! I think season 3, 4 and 5 of R&S, from what I've seen, is almost as good as the first two seasons, but not as good as APC. But I'm probably biased since I don't even like Ren & Stimpy. Jorge, you are a strange dude, did anyone ever tell you that? Only on the internet, but I consider it a compliment. I only like old cartoons. Ja, i remember this character, creepy and funny at the same time. I had a kind of love - hatred with this Brainchild.